Marlon with Aidan and Kerri at his Compassion project. He sits in a plastic white chair by the doorway, shoulders hunched forward, eyes down. That’s my first view of my newly sponsored boy, Marlon. He’s seven years old, and we are about to meet for the first time. 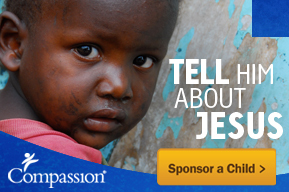 I have never met one of my sponsored children before this day. My son Aidan and I chose this boy from a stack of child packets during our flight from Miami to Managua just days earlier. As we prepared for this trip, we purchased three backpacks and filled them with gifts for our other three Nicaraguan boys. Then we decided to sponsor one more boy during the trip, so back to the store we went. One more backpack and a few other items later, and we were ready. While looking through the packets on the airplane, we narrowed our choices down to two boys. In Marlon’s photo, he had a bit of a scowl, and his information showed that he lives only with his father. There is no mother mentioned. My heart broke for him when I read that, and I knew he was the child for us. The night before we visited Marlon’s project, Aidan and I filled his backpack and wondered what our meeting would be like the following day. We’d seen many videos of joyous children at the moment they learned they had been sponsored. The videos showed tears, hugs and smiles from both sponsors and children, the start of beautiful relationships around the world. But our meeting with Marlon would not be like this. As we approach Marlon, he is surrounded by other children from the project. Korina, Compassion Nicaragua’s tours and visits specialist, is nearby, ready to translate for us during this special meeting. She tells Marlon that I am his new sponsor, and I kneel down in front of him, and can see right away that he is closing down quickly. He is nervous, probably scared, and continues to look down, unable to meet my eyes. As more children gather around us, he begins to cry quietly, wiping at his face quickly as if to hide this fact from the rest of us. Of course, this has me in tears instantly as well, and I tell him not to worry. I tell him it’s OK to be nervous, and that I have children at home who would be shy and nervous in a meeting like this as well. Marlon surrounded by the crowd. To break the ice, I give him the photo album I brought for him. I go through each photo, introducing him to each member of my family, as Korina translates. He gives very little response. I give him the soccer ball we brought for him, and he holds it in his lap. I begin to show him some of the items in the backpack, as Aidan takes photos, and the other children press in to see. We don’t get far before I suggest that he explore the bag on his own at home, as I can see this curious crowd, the pressure of my presence, is just too overwhelming for this young boy. I move to the chair next to him, and we take some photos together, but I can feel the tension in his back, and it is difficult to give him his space, when I really want to wrap him in my arms and tell him there is nothing to worry about. Marlon’s young aunt is with him at the project on this morning, so I ask her to tell me what his life is like at home. Her answer is not easy to hear. She says Marlon lives with his father, grandmother and two brothers. His mother left him when he was a baby, and he has only seen her a few times. I pat the knee of this brave boy sitting next to me, whose heart has been broken and battered already, at such a young age. I marvel at this perfect match for sponsor and child, him abandoned by his mother as a baby, and me by my father at birth, similar scars on our hearts. We sit together quietly for a while, and the crowd, losing interest in us, begins to move away. Marlon shows interest in his backpack. Marlon bends over and touches the backpack. Progress, I think. He struggles to adjust the straps on the bag, and I reach in and help him. He doesn’t seem to mind. He discovers the ball pump in a side pocket of the bag, and I use hand motions to show him where the needle is, how to put it in the pump, where it goes into his soccer ball. So we have connected in a small way, but our time is up. I promise to write him many letters before I stand to leave, patting his knee one last time. It is not easy to walk away from this boy. And I pray he will remember these moments when he begins to receive my letters, that he will remember the love in these moments, and that we will meet again in the future, to continue to build this blessed relationship. This entry was posted in Compassion International, Nicaragua and tagged child sponsorship, Compassion, Compassion tour, meeting child, Nicaragua, sponsorship. What a precious young man and such a tragic story. I hope that one day you will be able to share your story and that it will be an encouragement. I know that now that you’ll be writing, maybe he’ll start to build trust and eventually open up. I’m so glad you are now his sponsor!! My goal is for him to feel the love we have for him, and to continue enjoying the love I saw that others had for him at the project. He’s a special boy. I’m sure your love soaked into Marlon, even though he wasn’t able to show you right then! I just returned form Managua last night–Nicaragua is such a beautiful country. I left a pretty big chunk of my heart with those kiddos. Looking forward to reading about your trip, Breanne! I’d love to get back to Nicaragua again!